Machine translation is also called "automatic translation" or simply translation software. Machine translation software translates text in one natural language into another natural language, taking into account the grammatical structure of each language and using rules to transfer the grammatical structure of the source language (text to be translated) into the target language (translated text). Machine translation cannot replace a human translator for demanding applications such as legal or literary work, nor is it intended to. The term we use in the industry is 'gisting'. Modern MT software should give you about 80% accuracy and higher. Many companies that represent themselves as MT providers are actually selling "word by word" translation. Make sure you know what you are getting and ask a lot of questions about upgrade paths and integration..
How can I improve the accuracy of machine translation? The best way to improve the accuracy of machine translation is to pay close attention to the source text. The more simple and direct the source text is, the higher the accuracy of the output. Use of user dictionaries is also important where available, especially in technical fields. Most translation software will let the user edit the dictionaries to include any modifications that they deem necessary. This way if a word is used incorrectly or not included, it can be easily added so that future translations will be more accurate. What is "word by word" translation? Word by word translation translates each word or phrase that it understands, but does not take grammar into account. Word by word translators are generally not as effective as automatic or machine translators, but still can be very useful, for instance as a translation aid. How can I translate letters and other paper documents with my computer? You can scan it using optical character recognition (OCR) software and then use a translation program to translate it. You may need special OCR software that is designed to recognize the source language. 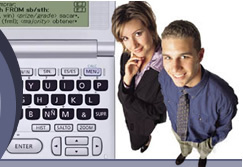 You can also re-type it into your computer, although this may be impractical if you are not familiar with the language or do not have the proper equipment such as multilingual word processing software, special keyboards, etc. What quality of translation can I expect from translation software? This depends on many factors such as the translation program, the type of translation, the grammar of the document to be translated, the use of a specialty dictionary or glossary, among other factors. The quality of the engine of the translation program and the size of its dictionary are usually the most important factors. Generally, you can expect draft-quality translations: the result can be readily understood, but will need editing and correction for professional use. Again, a professional translator or firm should be used for demanding or mission-critical applications such as legal or literary work. Can I translate web pages and e-mail? Yes! Several of the programs we sell allow you to translate web pages and/or e-mail directly. Other programs require you to cut and paste the information into the translation program before translating it. Can I add words and phrases to the dictionary of translation programs? Most of the programs we sell allow you to add words or change the meaning of existing words. This can greatly increase the effectiveness of the program. How do these translation programs operate? Are they easy to use? Translation software is as easy to operate as common word processing programs. First, you need to tell the program what text to translate. This can be done in one of several ways depending on the program. Some programs allow you to translate right in your word processor or other applications. In some programs you can open the document or text file directly in the translation program to translate. And in some programs you cut and paste the text into the program. Next, you may need to select the direction of the source and target languages and you may also have additional options available such as specialty or user defined dictionaries. And finally there may be a button to click to start the translation process. That's all there is to it! Much easier than learning to read Russian (or Spanish, or Italian, or whatever). Can I type a document in a foreign language using translation software? You may be able to type in the language(s) that the translation program uses. Also, your translation program may be able to operate right in your word processor. However, for regular use it would likely be better to use a multilingual word processor such as Global Writer or Global Office which can emulate the keyboards of over 100 major languages. For Chinese, Japanese, and other languages than do not use the Western character set you also may need to install a language support package. How can I spell check a foreign document? Some translation packages have spell check features. For English we have Bilingual Corrector, for French there is Le Correcteur, and for Spanish there is El Corrector. We also have Microsoft Proofing Tools line of spell checkers/grammar checkers for many languages that work with Microsoft Word. Yes! Some programs such as SYSTRAN can preserve the formatting of a document, in others you may have to cut and paste the text out of the document and replace it after translating.